I recently received some requests for a Oni mask & thought I would take this opportunity to show you how I make my resin masks. I’m not covering the process of creating the mold in this post; you would be much better served checking out Smooth-on.com for a very extensive library of mold-making and casting videos! 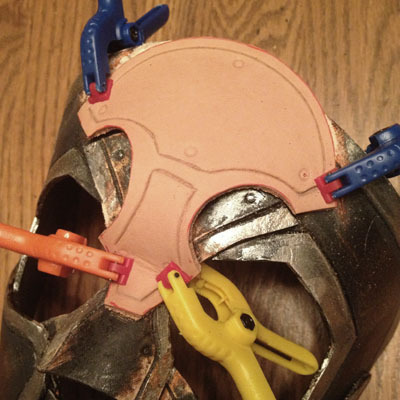 I used 3-4 coats of resin for each mask, what you see below are some de-molded masks with the flashing not trimmed off, I will also have to so some light sanding on the edges so there are no sharp parts. Batch of Oni and Skull half-masks with the flashing trimmed, I still need to cut the eye-holes out for the Oni masks – and drill the holes for the elastic cord that will be used to secure the masks. Sanded masks! – I use a dremel tool to smooth out edges and drill the holes where the elastic cord will pass through. Painted masks! – These have been sprayed with a coat of metallic spray paint, then I do washes of acrylic paint to achieve the look I want. After everything is dry they are coated with a clearcoat sealer. Finished Oni Masks – they have been sold & shipped off to their new homes. My next post will be about the Skull masks in the 2nd to last photo. Also, If any of you desperately want a unicorn horn to use for a costume or in your own craft projects let me know – I am thinking about posting a few in my shop depending on the demand for them. October Has Arrived! Fall is my most favorite time of year, while its getting colder and the leaves are getting crunchier the fruits of my labor grow near… one of the few times of the year masks are wanted, nay needed, Halloween! 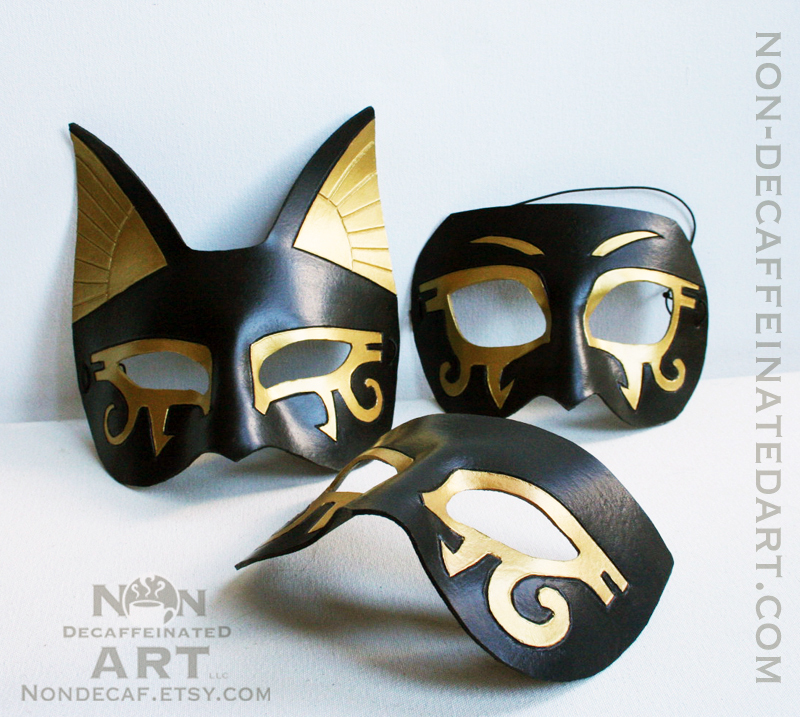 I have released a few new styles of resin mask, all of which can be seen in the below gallery. Some are posted in my shop pre-painted, others are listed as ‘DIY Blanks’ this means they sell at a reduced price from the fully finished masks as you would be doing some sanding and then painting the mask to any style you choose. That option is not for everyone, but for the do-it-yourselfers out there it is a fun project for an afternoon in. I would love to hear what you think about the new resin masks down in the comment section, I’ll be doing a step by step post about the making of the Oni masks (the ones with the horns and fangs) and hope to get some discussion going about the process. I can no longer accept return orders…Due to to a recent issues of people purchasing the masks, wearing them to a party then wanting to send them back after they have had their use of the mask, I will accept no more returns. Look for sanitary reasons you don’t really want to wear something that’s already been on someone’s face do you? On principal I’m not going to send you a mask that has had someone’s sweaty face all up in it, and I’m not going to do that to anyone else either. This is not a ‘used mask’ shop. This is a handmade Costume Accessories shop. You are welcome to cancel the order before it ships if you change your mind, However, once the item is shipped it is in the hands of the USPS mail carriers and the package can not be canceled or returned. Thank you so much for taking the time to read this! I hope to keep you entertained by posting more frequently! Please check my Shop at Nondecaf.etsy.com for a selection of ready made masks in stock. If you want a quote for a large order please use the contact form on the the Contact page // Or send me an Email at Nondecafinfo(at)gmail.com you can also reach out to me on social media if Email is not your thing! Thanks again for hanging in there with me & have a fantastic month!